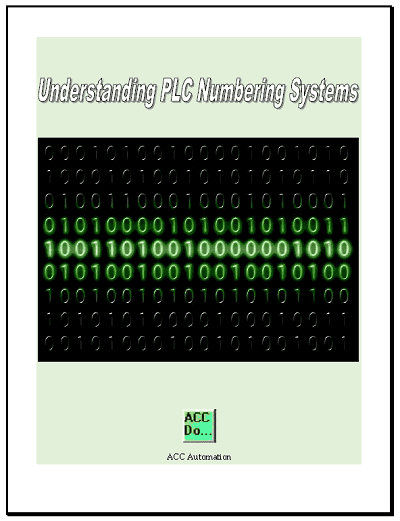 PLC programming involves both direct and indirect addressing. 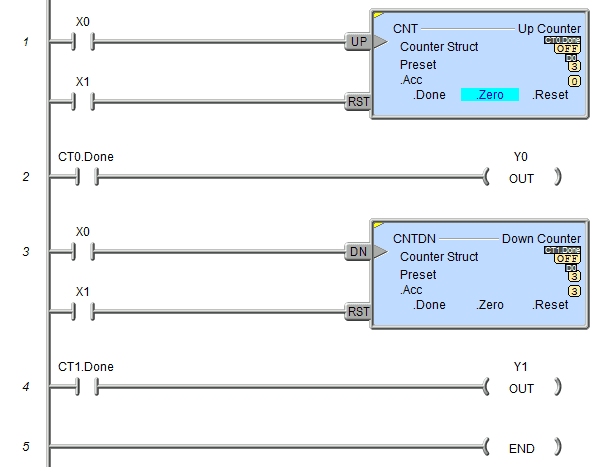 Direct address programming involves writing each ladder logic rung to do the operation required. We often forget about using the powerful indirect addressing to solve our logic. The below animated picture will show a simple example of using indirect addressing. This will use the MOVE instruction and transfer a word indirectly to output word V100. V[V0] means that the value in V0 will point to the V memory to get the value to move. You can think of this as a pointer for the memory location to move. Of course we need to monitor V0. Our values are in sequence from V1 to V6. We need to ensure that V0 is always in the range from 1 to 6. Lets take a look at a program sample using the Do-more Designer Software. We will set up the sequence similar to the animation above, but expand the program. This is the logic to set up the move instruction. The source is V[V0] which means the pointer is V0 in this memory area. The destination will be V100. 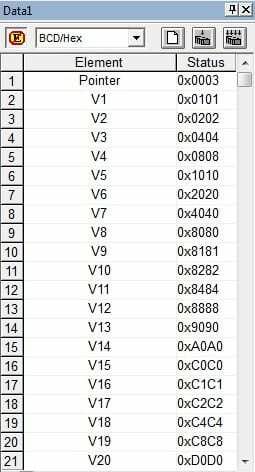 An internal timing bit ST5($100ms) is used to increment the pointer V0. This could also be done by an event or series of events. The pointer is then compared to ensure that it is between 1 and 37. Finally the output word is then transferred to the physical outputs. This is done by using the MAPIO instruction. Each bit can be set independently. This example uses indirect addressing to program a sequence based upon time. We could just as easily used indirect addressing to compare inputs to a table and set the outputs accordingly. You can see how this method can greatly reduce the amount of time to develop your program. This holds especially true if the sequence needs to be changed. It would be just a matter of changing data values in the table. 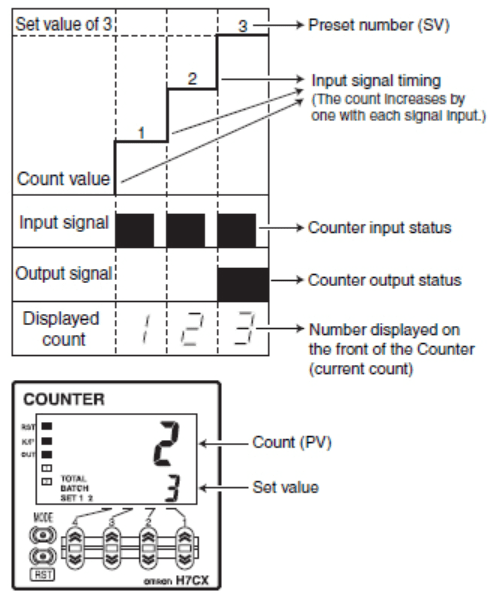 This use the control of an intersection traffic light to demonstrate direct versus indirect addressing. 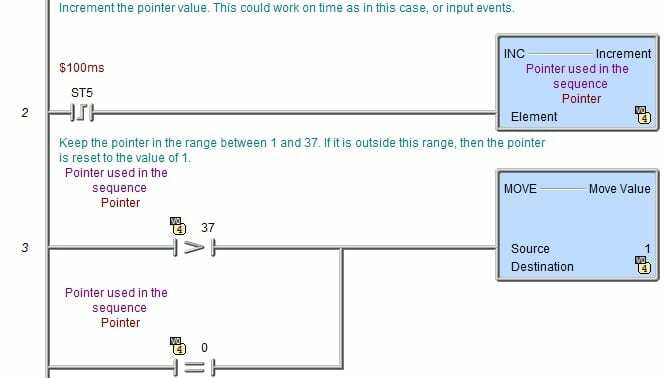 A sample program to control valves. This uses indirect addressing for the inputs as well as the outputs. 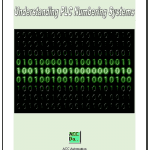 Using indirect addressing, this sample program will log information in the PLC to be retrieved at a later time. Indirect addressing is a powerful method of programming to simplify and program faster than you ever thought possible. 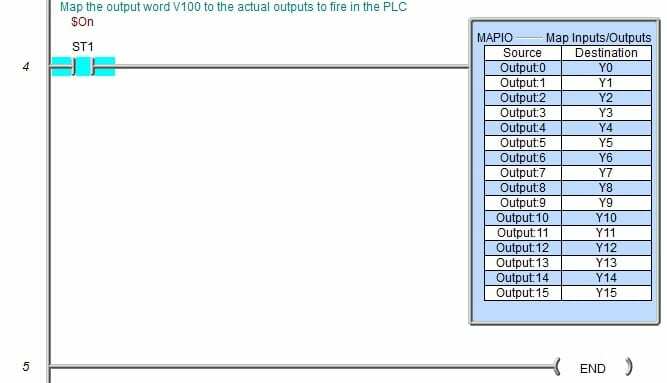 You can even use indirect addressing in the PLC to scale a non-linear analog input signal. Let me know you thoughts on using indirect addressing. What can you come up with?